Clothes & Camera - Luxembourg Fashion and Beauty Blog: OOTD: Green and Gold?! As I told you in a previous post we had guests on Wednesday. For that occasion I wanted to wear my sequin skirt and in fact I had planned to combine it with my denim shirt but then I noticed I didn't bring it to my parents' house. When thinking about what else I could wear with the skirt, these emerald tights I only bought last week came to my mind. The only green top I had was this tartan skirt so this (maybe a little strange) combination was born. How perfect that I also had golden flats and golden statement jewellery to round the look off. I know that some of you might think that this outfit doesn't match at all but I honestly love it and would wear it again anytime. What do you think guys? Would you wear this outfit? An interesting combination! I like the skirt and the green tights and shirt, so why not? You look great i love the green tight s and the short! Der Rock ist ja toll, echt schön! love the shirt, and look perfect with sequin skirt! So cool tying in the shoes and the skirt and then the shirt and the tights. Wonderful look. Especially love those colorful tights on your amazing and exciting legs. Thanks so much for that close shot of them. They are so lovely! I actually do like the outfit a lot! 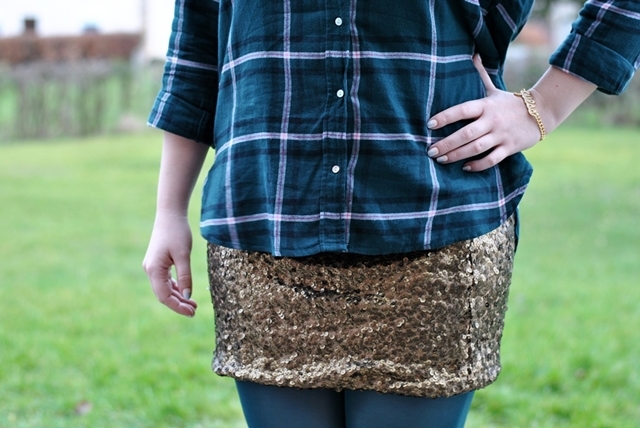 Who could have thought that sequins & tartan could go so well together! & I really like those tights as well- such a unique color! i would! that skirt is absolutely adorable.